Reproduction is the most vital process in the regeneration of our species and our society. Nevertheless, its influence on the shape of the modern world has been consistently overlooked by social scientists who have emphasized the erosion of the family in industrialized societies. 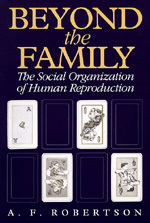 In A. F. Robertson's view families persist. And the goal of reproduction plays an essential role in everything from the organization of political parties to the growth of banks and factories. Robertson inverts the traditional wisdom that reproduction responds passively to the powerful transformative force of technology. Reproduction, he asserts, requires such extensive cooperation on the state and community level, as well as within the family, that it has had great impact on our social and political organization. Whether discussing Lesotho women and the South African economy or the effects of the family on the development of capitalism, Robertson demonstrates that the ramifications of human reproduction extend far beyond the family. Boldly argued and laced with cross-cultural comparisons, Beyond the Family synthesizes the writings of a range of thinkers. It is sure to garner discussion and debate among divergent scholars of many stripes. A. F. Robertson is Professor of Anthropology at the University of California, Santa Barbara.